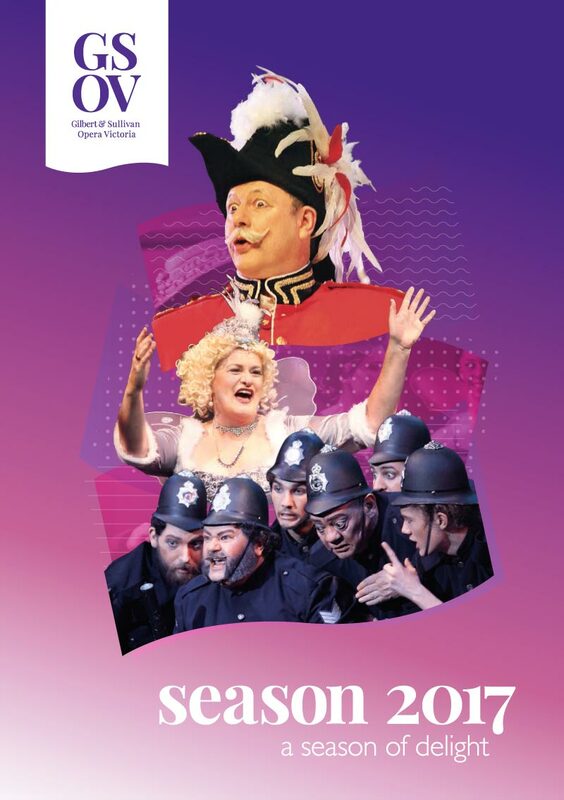 It is with great pleasure that I announce Gilbert and Sullivan Opera Victoria's 2017 Season and hope that you can join us for this exciting adventure. We have had enormous fun and success with our 2016 productions (The Gondoliers, Chu Chin Chow, and the Gilbert & Sullivan Gala Spectacular) and cannot wait to get started on the upcoming season. We're excited to introduce our GSOV	Season 2017 Subscription Packages, they	represent the best value for money, saving	you over 33% with tickets to all 4 shows. A Song to Sing O! returns to the stage with one of Gilbert & Sullivan Opera Victoria's most versatile and acclaimed performers, evergreen entertainer, Ron Pidcock, leading an accomplished cast under director, Robert Ray. Written by Melvyn Morrow (Dusty) employing lyrics from WS Gilbert, the music of Arthur Sullivan with additional songs by its talented subject, George Grossmith; this musical play about one of Gilbert & Sullivan's most celebrated patter men takes place in his dressing room ahead of his last appearance with the D'Oyly Carte company. With a promising solo career beckoning, Grossmith cleverly weaves insights and gossip amongst performances of some of the most well-known pieces from the G&S canon. A light-hearted biographical piece, this is a delightful insider peek into the renowned musical theatre team and a must-see for any fan of light opera. "A blissful marriage of witty dialogue with some of the most enduringly popular music and lyrics ever written"
"As a source of innocent merriment, this is one to put on your little list." Arguably one of the world's most adored and applauded operettas, this madcap melee of maidens fair and feisty, pirates rum-filled and rumbustious, police crafty but cowardly and a sweetheart who's a slave to duty, showcases Gilbert & Sullivan at their best and brightest - a consistent fan favourite for music-lovers worldwide. Director Nicholas Renfree-Marks, joined by MD Trevor Henley are excited to bring a brand new vision for the swaggering, satirical and sea-faring musical comedy. Expect nothing short of dance defying stunts, swordplay and sensational singing. Don't miss this show! Relax and revel this summer with our boutique production featuring the glorious music of Ivor Novello. Playwright, composer and popular matinee idol actor, Novello had a remarkable career spanning close to forty years. Novello's first big success, "Keep the Home Fires Burning" cheered Britain ahead of the First World War. "We'll Gather Lilacs (in the Spring Again)" a wartime waltz, was written for troops in the Second World War. GSOV Director Robert Ray revives a showcase of songs from the golden era of the British stage musical. Enjoy a complimentary glass of champagne as you wander an elegant English garden in Melbourne's leafy Dandenong Ranges. 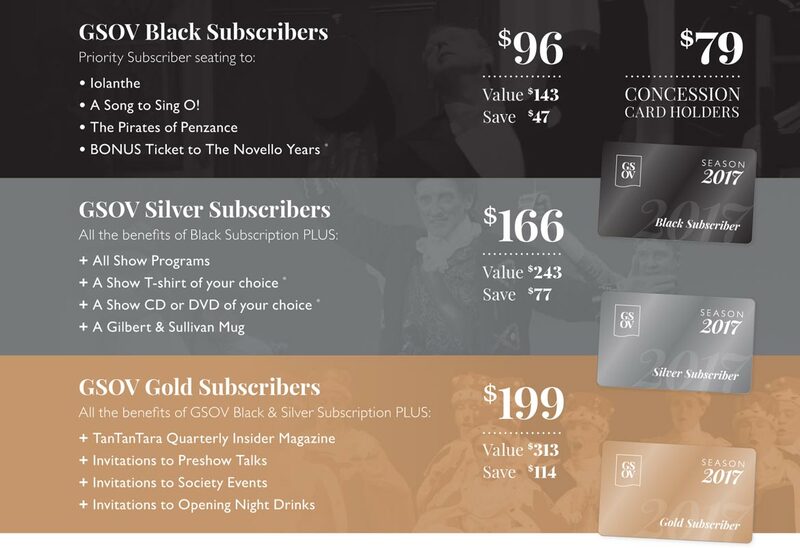 GSOV	Season 2017 Subscription Packages	represent the best value for money, saving	you over 33% with tickets to all 4 shows starting from $79. The Gilbert & Sullivan Society of Victoria Inc. is a registered Not-for-Profit organisation. All donations over $2 are fully tax deductable in Australia. ^ Available through the Ticketing Secretary during Subscribers exclusive booking period. * Subject to availability. # Australian residents only.